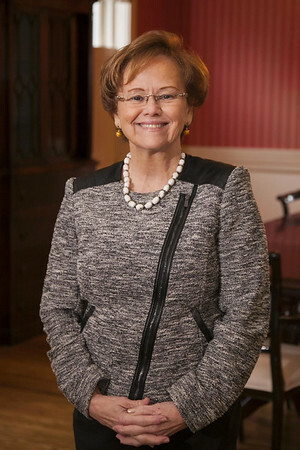 The new president of Dickinson College will continue her advocacy for education and strong communities. Margee Ensign’s advocacy for women’s education and empowerment dates to her first year in college at the newly co-ed Fairfield University, where she earned positions on both the college newspaper and the men’s tennis team. “Of course that didn’t make the guys very happy,” she gleefully recalls. And that advocacy was tested during her time as president of American University of Nigeria, where she contended with the Boko Haram insurgency, known for the mass kidnapping of young women from another college. Ensign transferred to New College after a year at Fairfield and quickly began developing those formative relationships. She graduated in 1976. Her mental tenacity and drive to overcome challenges suited Ensign to the school’s academic rigor, and these traits would follow her throughout her career. As president of AUN, where Ensign and her community stood up to a deadly terrorist group, the big picture was infinitely more valuable than departmentalized knowledge. Yola, the capital city of Nigeria’s Adamawa State and the home of AUN, faced devastating problems that needed to be ap- proached with great care. “The challenges of leadership were greater than I thought I could handle,” she says. “We had Boko Haram 50 miles from campus, [and] we had 400,000 refugees in the community,” more than doubling the city’s population. It was only through connecting the Yola community leaders that they were able to develop a plan to move towards peace, safety and empowerment for the people displaced by the insurgency. Called the Adamawa Peace Initiative, AUN brought together “all the Muslim leaders, the Christian leaders, the women’s groups, … and that’s what kept the area safe and people fed,” she says.